Previously I blogged about prov-template, an approach for generating provenance. It consists of a declarative definition of the shape of provenance to be generated, referred to as template, and sets of values to instantiate templates into concrete provenance. Today, I am pleased to write about a new online service allowing such templates to be expanded into provenance. The service is available from https://openprovenance.org/services/view/expander. I will now illustrate its use through a few examples. First, let’s consider an example of template (see https://openprovenance.org/templates/org/openprovenance/generic/binaryop/1.provn for its provn version). Visually it look like this. It shows an activity, two entities used as input and an entity generated as output. There is an agent associated with the activity. The output is derived from the two inputs. This provenance description is contained in a provenance document, but what makes it a template is that the identities of nodes are variables (URIs in a reserved namespace with prefix var: var:produced, var:operation, …). These variables are meant to be replaced by concrete values. Variables are also allowed in value position of property-value pairs (cf. var:operation_type). This template for instance could be used to describe the addition of two numbers resulting in their sum. The template service looks as follows. Two input boxes respectively expect the URL to a template (you need to ensure that the template is accessible to the service) and the bindings between variables and values to instantiate the template. For convenience, the template pull down menu already provides the link to the template described above. Likewise, the example pull down menu contains several examples of bindings. Let’s select the first one, and click on the SVG button to generate an SVG representation of the expanded provenance. The result is as follows, variable names have been instantiated with identities of activity, entities and agent, but also with values of properties. 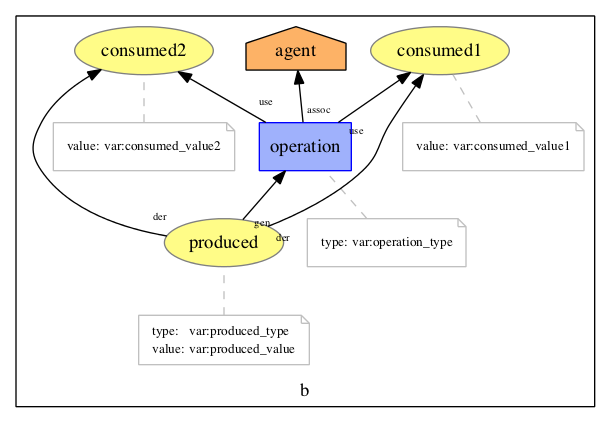 Property-value pairs whose value was variable not assigned by the bindings are simply removed from the expanded provenance (for instance, as variable var:operation_type is unassigned, the property type was removed from the expansion). Below, we find the expanded provenance for the fourth binding. There, we see that two different outputs were provided output1 and output2, and they have been given different numbers of attributes. The language to express the bindings is a simple json structure. The first set of bindings is expressed as follows. Go ahead and experiment with templates and bindings using the service. For more details, please see previous posts. The aim of this blog post is to provide simple guidelines to generate provenance using the PROV-Template approach. A quick reminder: a provenance template is a PROV document, describing the provenance that it is intended to be generated. 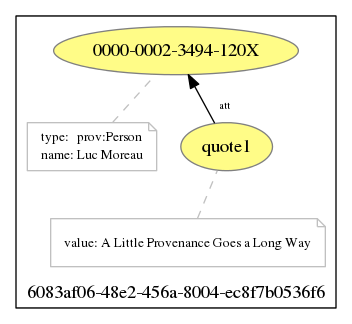 A provenance template includes some variables that are placeholders for values. So, a provenance template can be seen as a declarative specification of the provenance intended to be generated by an application. A set of bindings contains associations between variables and values. 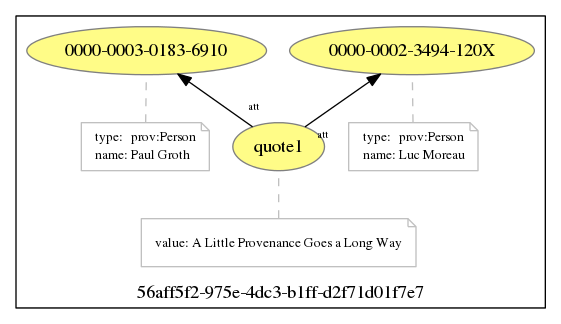 The PROV-template expansion algorithm, when provided with a template and a set of bindings, generates a provenance document, in which variables have been replaced by values. Therefore, three steps are involved in this methodology. Design a “provenance template” describing the structure of the provenance intended to be generated. Instrument the application, log values, and create “binding files” from these values. Produce provenance by expanding the template using binding files. We consider a simple computation, which we would like to describe with provenance. The computation consisted of 3 calls of binary functions: the functions were composed in such a way that the results of two calls were used by the third one. To simplify, we assume that the operations were arithmetic +, -, and *, and the values flowing and out of these operations were integers. Note my use of past tense: the aim of provenance is to describe past computation, as opposed to a future, hypothetical computation (or workflow). As we have 3 binary functions, we design a template describing the invocation of a binary function. It consists of an activity (denoted by variable operation), two used entities (denoted by variables consumed1 and consumed2), a generated entity (denoted by variable produced), and an agent (denoted by variable agent) responsible for the activity. Graphically, the template can be represented as follows. Using the PROV-N notation, the template is expressed as follows. We see that variables are declared in the namespace with prefix var. Each entity and activity is associated with a type, expressed by a variable, which can also be instantiated. To be able to generate provenance, one needs to define so-called “bindings files”, associating variables with values. 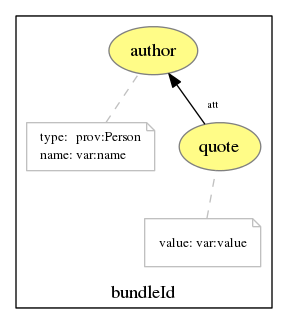 The structure of bindings file is fairly straightforward: with the most recent version of the ProvToolbox, a bindings file can be expressed as a simple JSON structure. Such JSON structures are very easy to generate programmatically from multiple programming languages. However, in this blog post, we do not want to actually program anything in order to generate provenance. Therefore, we are going to assume that the application already logs values of interest. We are further going to assume that the data can be easily converted to a tabular format, and specifically, that a CSV (comma separated values) representation can be constructed from those logs. The structure that we expect is illustrated in the following figure. In the first line of the file, we find variable names (exactly those found in the template) acting as column headers. In the second line, we find the type of the values found in the table. Application log as a CSV file. First line contains variable names whereas second line contains the type of their values. Subsequent lines are the actual values. Concretely, the CSV file uses commas as separator. The third, fourth, and five lines contain deftail of the invocations of the plus, times, and subtraction functions. Each line can automatically be converted to a JSON file. For instance, the third line containing the details of the addition operation can be converted to the following JSON structure, which is essentially a dictionary associating each variable with its corresponding value, with an explicit representation of the typing information where appropriate. We do not need to create this JSON structure ourselves. Instead, we provide an awk script that converts a given line into a bindings file. To facilitate the processing, we even provide a Makefile with a target do.csv that processes a line (variable LINE) of the csv file to generate a bindings file. It is then used by the utility provconvert to expand the template file. The target workflow hard-codes the presence of three lines in the CSV, the generation of a bindings file for each line, and the expansion of the template with these bindings. All files are then merged in a single provenance file using the -merge option of provconvert. The resulting provenance is displayed in the following figure. 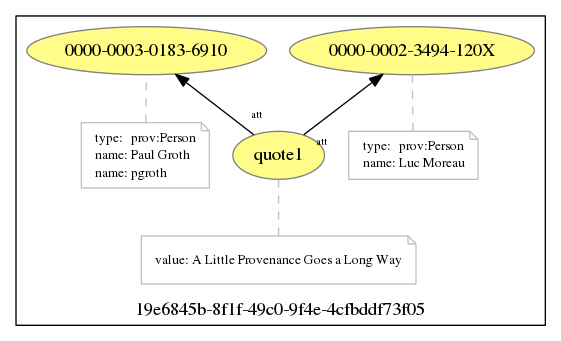 Expanded provenance showing three activities, consumed and generated entities, and an agent. Given a log file in CSV format, we have shown it is becoming easy to generate PROV-compliant provenance without having to write a single line of code: an awk script converts CSV data to JSON, used to expand a template expressed in a PROV-compliant format. For the provenance to be meaningful, the application must be instrumented to log the relevant values. For instance, each entity/agent/activity is expected to have been given a unique identifier. The template design phase is also critical. In our design, we decided that one template would describe the invocation of a single function. The same template was reused for all function calls. Alternatives are possible: multiple activities could be described in a single template, alternatively different types of activities could be described in different templates. I will come back to this issue in another blog post in a few weeks. What is in ProvToolbox 0.7.3? Today, I released ProvToolbox 0.7.3. The principal changes in this new version of ProvToolbox are concerned with prov-template, the templating system for provenance. The new release also contains few minor bug fixes and changes. A reminder: a PROV-template is a PROV document, in which some variables are placeholders for values. A PROV-template is a declarative specification of the provenance intended to be generated by an application. A set of bindings contains associations between variables and values. 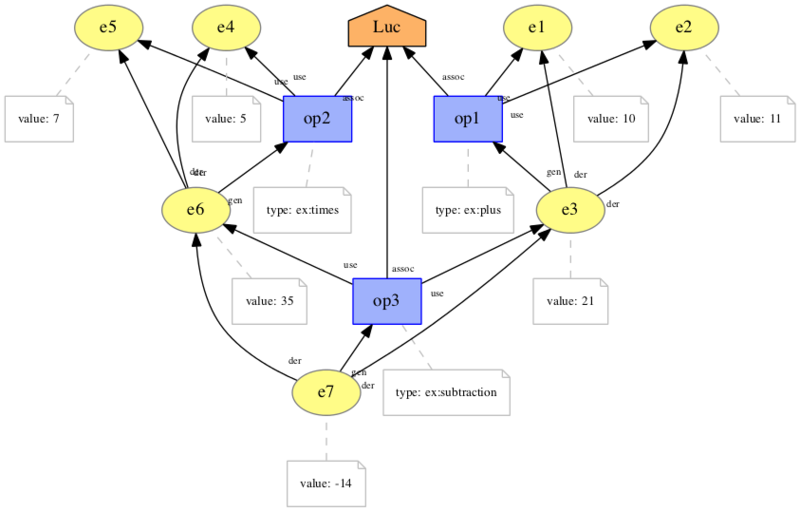 The PROV-template expansion algorithm, when provided with a template and a set of bindings, generates a provenance document, in which all variables have been replaced by values. PROV-template is a new approach to creating a provenance-enabled application. Templates are designed and embedded in the application’s code, the application logs values (in the form of bindings), and provenance is automatically generated by template expansion. ProvToolbox Tutorial 4: Templates for Provenance (part 1). ProvToolbox Tutorial 4: Templates for Provenance (part 2). In ProvToolbox 0.7.3, we have adopted a more compact and user-friendly representation for sets of bindings. Instead of representing them as PROV, we can now represent them as JSON. At the same time, we also handle variables in a more uniform manner, allowing variables occurring in mandatory position, to be also used in attribution position. I won’t go into the technical details, but these two changes make the design of templates and the construction of bindings much simpler! A further change is that we have implemented a simple “bindings bean” compiler: it takes a template definition and creates a java class, which allows sets of bindings to be created directly from Java, and serialized easily. The aim of this compiler is to simplify the implementation of applications generating provenance. The GitHub source code repository contains code for two further tutorials (Tutorial5 and Tutorial6). I will write up the text for these tutorials in the New Year. At the recent PROV: Three Years Later Workshop, I made the case for the Qualified Pattern to be used for all PROV relations. 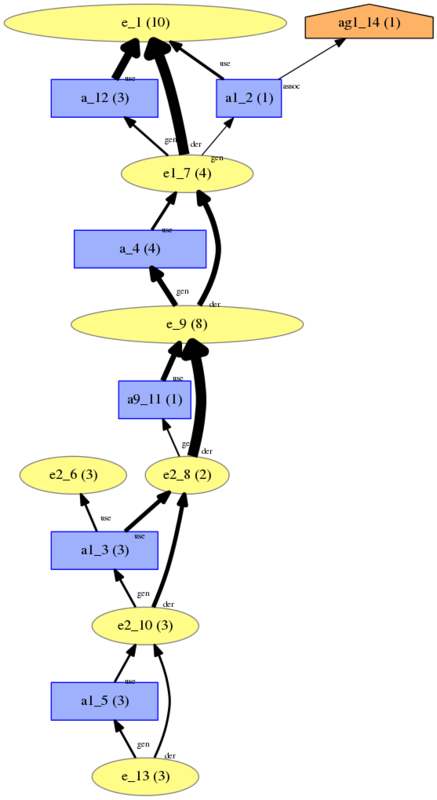 My key motivation for this extension to PROV is my provenance summarisation algorithm, which generates a “summary provenance graph“, in which nodes and edges are annotated with weights indicating how frequently these kinds of nodes and edges can be found in the original graph. To allow for such annotations to be added to specialization, alternate, and membership relations, they need to support the Qualified Pattern. At this stage, it is the data model that is modified. Serialization to xml and provn is work in progress, and not supported in prov-json and prov-sql yet. Furthermore, there is no parsing yet. Three new interfaces have been defined in the package org.openprovenance.prov.model.extension. For full details of the changes, see the release log at https://github.com/lucmoreau/ProvToolbox/wiki/Releases#073. We keep on using ProvToolbox in various applications to generate provenance with templates and to undertake some analytics using the summarisation algorithm. This new release was critical to support these two use cases of ProvToolbox. Shortly, I will release two further blogs with new tutorials for prov-template. As always, all relevant links can be found at http://lucmoreau.github.io/ProvToolbox/, including binary installers for linux (rpm and debian) and macosx. What is in ProvToolbox 0.7.2? Yesterday, I released ProvToolbox 0.7.2, which includes the following novel features. Continuing our efforts of providing binary installers to facilitate installation of ProvToolbox, this release includes an installer for MacOS X. Simply follow the link http://openprovenance.org/java/installer/provconvert-0.7.2.dmg, you will then be given access to the installation image. Click on the Installer. Note that you need to allow installation of programs from any sources in your security preferences. Then simply follow the instructions. 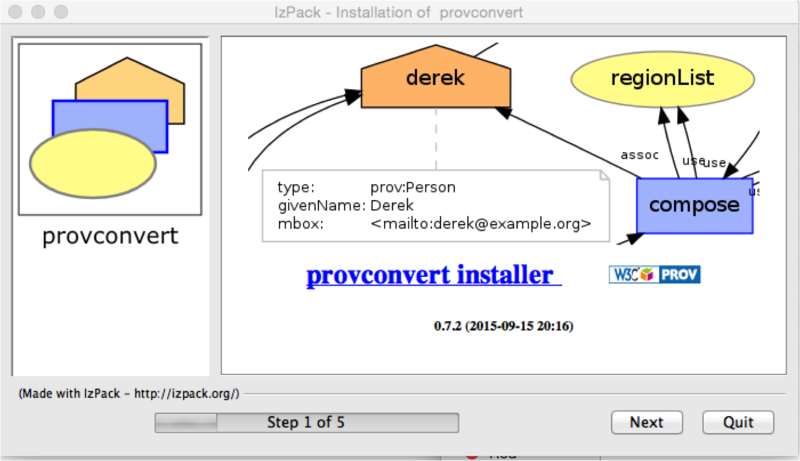 The installer will install all libraries and executable in /Applications/provconvert (default location, which can be overriden), as well as a symbolic link making the provconvert executable available in your execution path. An Uninstaller is also available as an executable jar file /Applications/provconvert/Uninstaller/uninstaller.jar. Et voila! The executable can be invoked directly from the command line. which should return provconvert version 0.7.2 (2015-09-15 20:16). As we continue to use templates in our applications, two further requirements have been implemented. It is now possible to expand a template, and strip the result from any variable that has not been instantiated. For this, simply pass the option -allexpand to provconvert, to be used in conjunction with the -bindings option (see Tutorial 4 (part 1) and Tutorial 4 (part 2) on template processing in ProvToolbox). Furthermore, an error code is returned when not all variables have been expanded. As we are integrating Provtoolbox, ProvStore and ProvStore in the inter-operability harness developed by the Software Sustainability Institute, we have fixed some minor issues to ensure interoperability between our software stacks. The artifact toolbox has been renamed into provconvert, since we have plans for other artifacts out of ProvToolbox. For all details about ProvToolbox, see the github.io page http://lucmoreau.github.io/ProvToolbox/. What is in ProvToolbox 0.7.1? Yesterday, I released ProvToolbox 0.7.1. It is a minor release, fixing minor bugs of 0.7.0, and including a useful new feature. To facilitate installation, a new binary release format is now supported: Debian packaging to support binary release on Ubuntu and other Debian-based Linux distributions. You just need to run the following commands. Modification of the visualisation component prov-dot allow dge thickness, node size, and tooltips (on SVG) to be controlled. For this, the provenance graph nodes and edges need to be annotated with reserved attributes dot:size and dot:tooltip. The following figure illustrates the kind of graphs that can now be generated. A summarisation of the provenance challenge workflow. Nodes are to be understood as provenance types. Thickness of edges and size of nodes reflect their frequency in the summarised document. I also fixed some minor bugs in qualified namespaces in the prov-sql package, and updated reserved namespace for provtoolbox. Tell me how you use ProvToolbox and/or provconvert and for for which purpose. Share details of your projects with me, I will add them to https://github.com/lucmoreau/ProvToolbox/wiki/Projects-and-Applications-Using-ProvToolbox. In several of our applications, we felt the need of separating the logging of information from the constructing and storing of provenance. For this, we introduced PROV-Template a templating system for provenance, describing the shape of provenance graphs to be generated, and we specified an algorithm capable of instantiating templates, with specific values. The purpose of this tutorial is to introduce PROV-Template and how templates can be instantiated using ProvToolbox. This functionality is directly available from the command line using provconvert. The tutorial is standalone and a zip archive can be downloaded from the following URL: http://search.maven.org/remotecontent?filepath=org/openprovenance/prov/ProvToolbox-Tutorial4/0.7.0/ProvToolbox-Tutorial4-0.7.0-src.zip. The tutorial can also be found on the ProvToolbox project on GitHub. Building on blog post “A little provenance goes a long way”, imagine that we need to systematically provide attribution to quotes. As this is a repetitive tasks, we should consider the PROV-Templates approach to generate provenance. A provenance template is itself a PROV document in which some variables act as placeholders for values to be filled at expansion time. More precisely, a template is a bundle of PROV assertions: a bundle is the PROV mechanism by which provenance of provenance can be expressed. The quote is attributed to the author agent. The variables var:author, var:namer, var:quote, var:value are qualified names in a namespace reserved for PROV-Template variables, and are conventionally prefixed with the prefix var. There is an expectation that values need to be provided for these variables when instantiating a template. On the other hand, the variable vargen:bundleId, with prefix vargen, can have a value generated automatically at instantiation time. Concretely, in the PROV-N notation, the template is expressed as follows. Let’s now look into how we can instantiate the templates. Let us consider the following bindings for the 4 variables author, name, quote and value. An association between a variable and a value is referred to as a binding. If we instantiate the template with these bindings, we obtain the following instantiated document. We note that vargen:bundleId was instantiated with UUID value. Expansion of a template with provconvert is straightforward. The parameter -infile must be used to provide the template. The binding file is specified with the -binding parameter. The resulting instantiated template is specified with -outfile. The input template and its instantiation can be expressed in any of the formats supported by ProvToolbox. We still have to express the set of bindings. We did not want to introduce a new specific format (though we may do it in the future), so, we just decided to use PROV. In particular, the Turtle notation is fairly elegant in this case. Two family of properties are introduced in the tmpl namespace, namely value_i and 2dvalue_i_j, for binding variables in identifier and value positions, respectively. tmpl:2dvalue_0_0 "A Little Provenance Goes a Long Way". Details about the syntax of bindings can be found in https://provenance.ecs.soton.ac.uk/prov-template/. In some cases, we would like to express that there is a second author to a document. The attribution template does not need to be redefined. We simply need to provide relevant bindings for the second author. For instance, Paul and Luc are the two authors of that quote. Conceptually, we want to provide the following bindings. We see that each of var:author and var:name is given two values. This results in the following expanded provenance graph. The contents of the bindings file is explicit below. Lines 7-9, var:author is given two values, using the properties tmpl:value_0 and tmpl:value_1. Lines 10-12, var:name is given two values to occur in attribute position, with properties tmpl:2dvalue_0_0 and tmpl:2dvalue_1_0. Again, we refer the reader to the PROV-Template specification for details of the bindings syntax. In general, PROV also allows for variable number of attribute values to be provided for a given attribute. For instance, we may want the name and nick name to be provided as two possible values for the var:name variable. This would result in the following expanded graph. Again, the template remains unchanged, but the bindings are as follows. In lines 12-13, we see two possible names for Paul, respectively expressed with tmpl:2dvalue_1_0 and tmpl:2dvalue_1_1. This shows that template expansion can support a variable number of attributes for different statements instantiated from the same template statement. It allowed us to fine tune the provenance, independently of the application. It permitted us to keep the code to generate the provenance separate from the application itself. It allowed us to adopt a more conceptual approach to provenance, thinking of “provenance schemas” rather than instances. This is the first part of the tutorial on PROV-Template. In the second part of the tutorial, we will see how PROV-Template can support more sophisticated use cases. Thanks to co-authors Dong and Danius. Heather has been using it in Smart Society’s SmartShare application.